C.F. 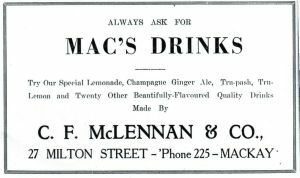 McLennan and Co. commenced trading from the old Rae Brothers Factory at 27 Milton Street around 1939. The business ceased trading in the 1970's and the site of the old factory was occupied by the Aboriginal and Islanders Community Health Service until recently. 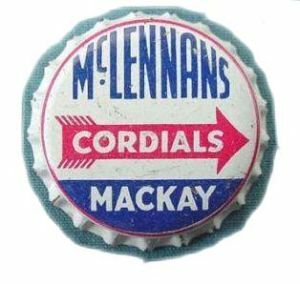 One example of a McLennans crown cap bottle. A knocked around example of another style of a McLennans bottle found in rocks at East Point in 2004. A rare example of a McLennans 24 oz. crown cap bottle with an enamelled label supposedly of Brampton and Carlisle Islands..
An example of a McLennans crown cap. A McLennans Advertisement. Mackay - Blair Athol Illustrated Record (1946).